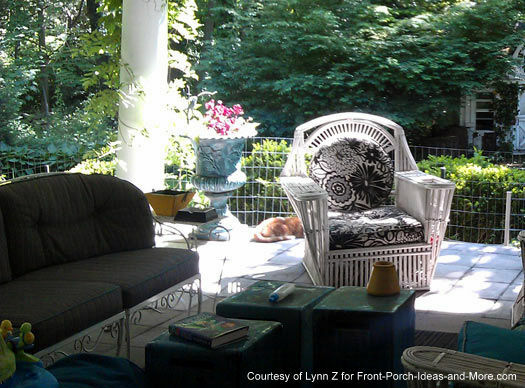 Lynn shares her story of adding wood porch railings to her porch. 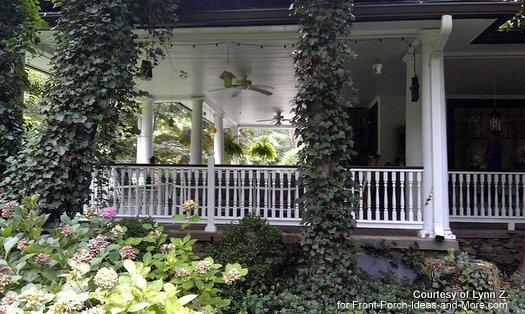 Lynn: Our house was built in 1925 and we believe the porch is original. It never had a railing around it and we never really thought about adding one. 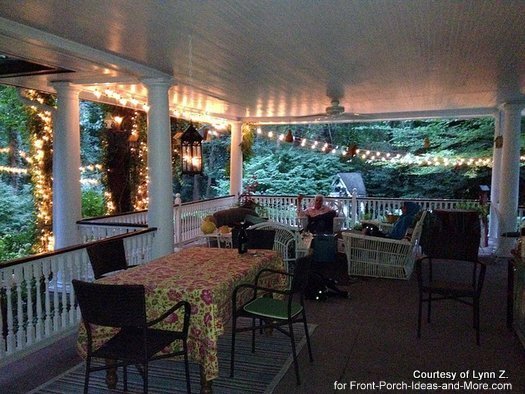 We love the porch the way it is and spend most of the year out there. We only use our living room in the winter. We added ceiling fans a few years back but other than that we haven't done anything. We have 4 large dogs and my daughter who lives nearby has another one. At any given time there are 5 dogs running through our yard. Two years ago my daughter got married in our yard. In preparation for this, my husband put some very ugly wire fencing around the porch to keep the dogs up on it and unable to get to the gardens and lawn. 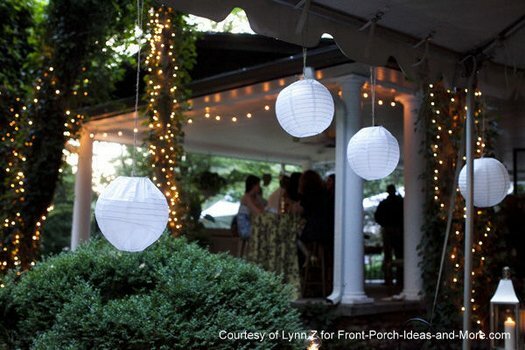 He spent months getting everything in shape for the wedding and the result was very beautiful! But then...we were left with a great lawn, beautiful gardens and a very ugly fence. A year later my daughter had our very first grandchild. 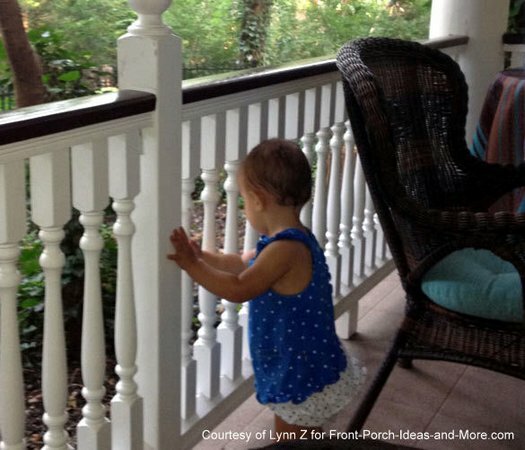 This began the quest to figure out how to enclose the porch for Layla so she couldn't fall off and get hurt. 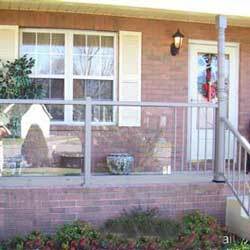 We looked at every solution, including iron fencing, aluminum, vinyl and trek decking type fences. 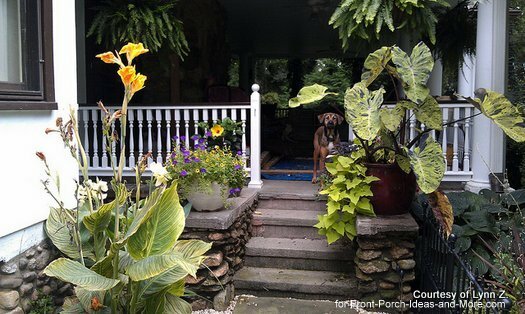 I was so unhappy about the choices because every time I sat out there I thought I would be ruining the entire look of this wonderful porch by adding anything at all. I especially didn't want anything that looked wrong for the period of the house. Through my searches online I came across Vintage Woodworks and thought this might be our best option. We were worried about having to paint everything and the upkeep on real wood as opposed to vinyl or something pre-finished. 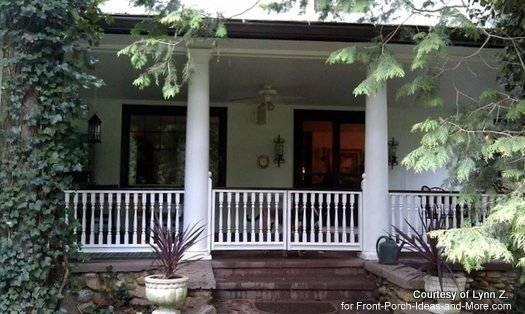 In the end, after much discussion, we went with the real wood porch railings. 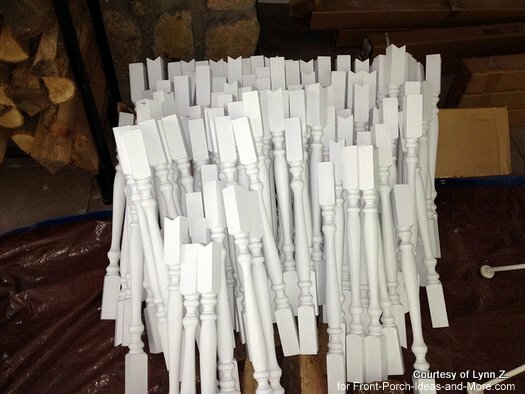 It took over 300 wooden balusters (railings. 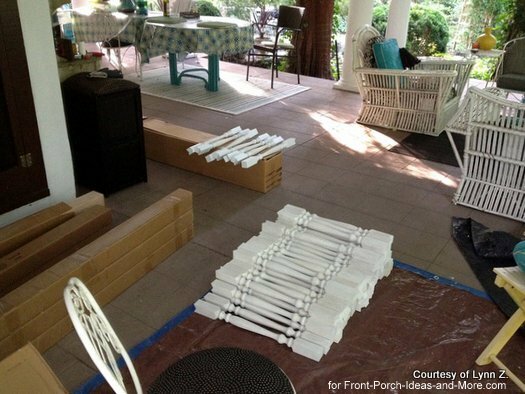 Vintage Woodworks made it easier by helping me to figure out the sizes I needed between each column of the porch and cutting them to approximate size before shipping. Every other place I went to would have just sold me the long pieces of unfinished wood and we would have had to cut and router each section. I think it would have taken us years to do! Vintage Woodwork's system is setup to assemble easily and without showing any hardware (something I liked a lot). 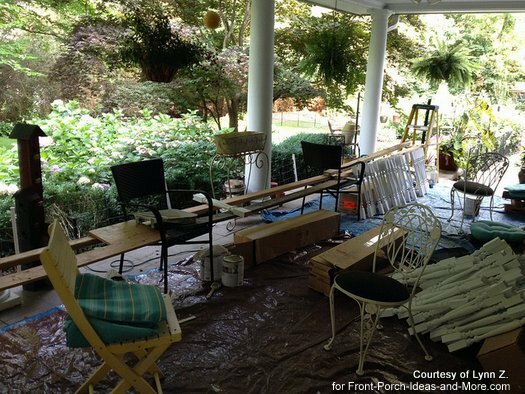 The job was big because of the size of the porch but a lot easier than it would have been had we chosen a different system or constructed our own porch railings. 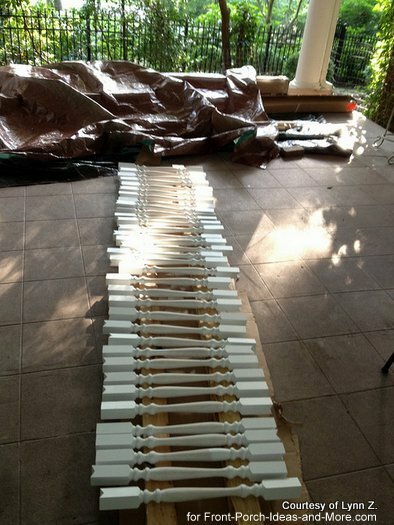 When we got the shipment I was really concerned with how to get everything primed and painted, as recommended, before assembly. This is when I wrote to you asking for some advice. It turned out to be a bit easier than we thought it would be by balancing the balusters on some 2 x 4s. Anyone want to help paint? Adding wood porch railings makes a nice difference. Notice the front gate, too. Going with real wood was the right decision and it looks like it has always been there. We love how it turned out! It somehow made the space even cozier and it seems even larger if that is possible. 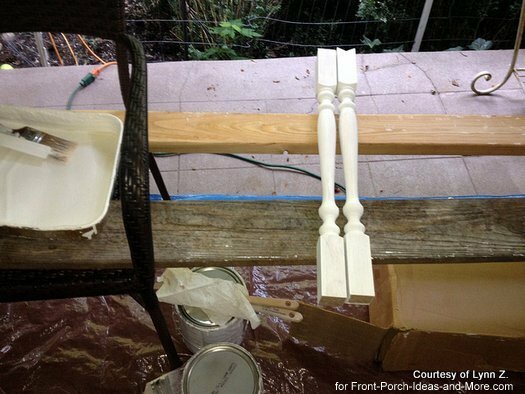 We made the decision to stain the top railing and polyurethane them instead of using the white paint that we used on the balusters and newel posts. I think it was a great decision and I really love the results. The dark brown stain matches the dark brown trim on the house and again it looks like it has been there forever. 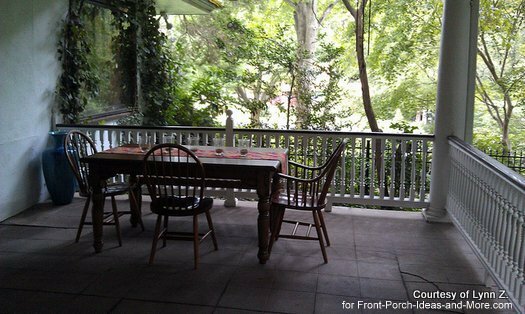 We sincerely appreciate Lynn and her husband sharing the story of their 1925 porch with us. 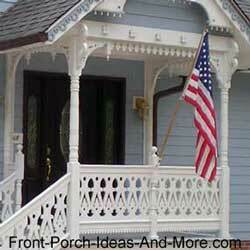 Adding wood porch railings to their beautiful vintage porch is certainly worth every linear foot and hour of painting. And...we are happy they found Vintage Woodworks. The folks there pride themselves in "bringing back yesterday in quality and service"
Plain or elegant? Wood or glass? Glass Panels Instead of Railings?